I mentioned a few weeks ago that I would discuss pedal point and never got around to it. These last few weeks have been way, way, too busy. I need to make some changes quickly to restore some balance to our family life and am committed to doing so. Basically, I need more employees and I need a warehouse. It is a lot of work finding either of those things (much less both), but I will get there. This is the tag. Note the numbers in red. 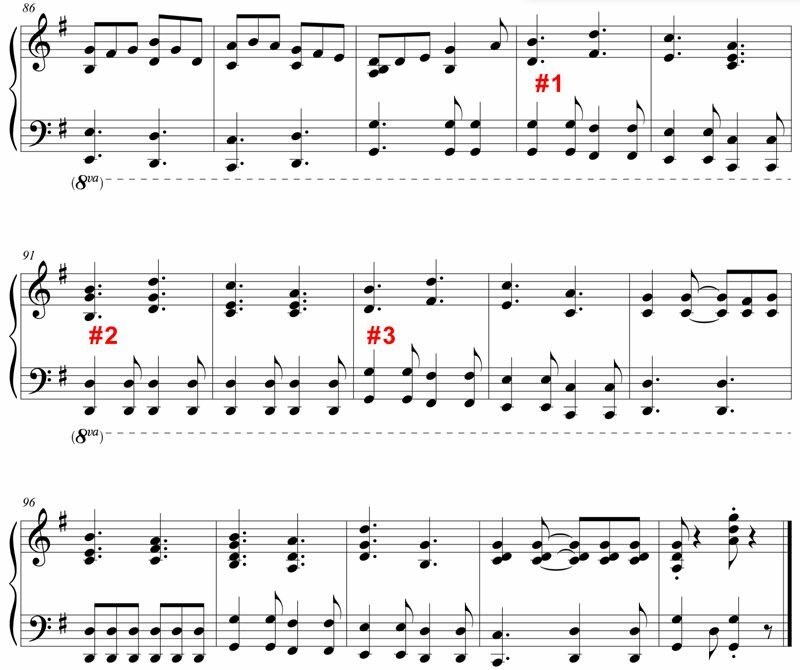 I am repeating a two-bar phrase of the melody three times to create the beginning of the elongated ending. To get some contrast into that repetition, I am playing the second iteration over a pedal. More technically, I am playing over a pedal V because we are in the key of G and D is the fifth note in a D scale. You could also say I am playing a dominant pedal because V is a dominant chord in harmony. There are two primary pedal points that are used: a tonic pedal which is the first note of the scale of the underlying key and a dominant pedal which is the fifth note of the scale of the underlying key. In other words, in the key of C, C is the tonic pedal and G is the dominant pedal. I will talk about why you would use one or the other in a second. Could you use other pedals? Maybe but they would not be as versatile and certainly require more writing skill. I will tell you that at this point, I wrote a lot of technical stuff about how all this works. For example, why does a IV chord played over a V in the bass have the same function as a root position IV chord? (Answer: because a IV/V is just a suspended dominant and suspended dominants basically function as subdominants.) But then, I erased it all. It gets confusing when we get into all the possible variations and I sort of came to the realization that it does not matter. The whole point of using pedal points is that you can get an interesting sound without having to work or think very hard. Basically, here is the rule: play a pedal point when it works. If it doesn’t work, try changing the chord on top to something else that fits the melody note and works well with the pedal point. If you can’t find anything, abandon the pedal. But you will be shocked how often it works. Now, why would you choose a tonic pedal over a dominant pedal? It is not rocket science. If we examined the harmony created by pedals, we would find that the majority of the chords are shifted toward tonic and subdominant functions when you use a tonic pedal. On the other hand, when you use a dominant pedal, the majority of the chords are shifted toward subdominant and dominant functions. Tonic sounds are more resolved and dominant sounds are transitional. If you are trying to build suspense (as I am in the example above), use a dominant pedal. If you are building into the huge verse of a ballad, you want a dominant pedal. If you are not necessarily trying to move anywhere in a hurry, you might like the tonic pedal better. Tonic pedals are more versatile as well. Speaking for myself, I don’t use tonic pedals very often at all; and I probably use dominant pedals too much. Dominant pedals fit my harmonic palette very well because all of those chords played on top of a V pedal end up creating colorful dominant functions that I like to use anyway. Like any other trick, don’t go to the well on this too often and don’t hang out on a pedal too long. Pedals definitely belong in your bag of tricks though, especially the dominant pedal through transitional or setup sections of your writing.